Not only does our website have a new look and feel, but it also offers numerous features to make it easier for you to search for jobs and get vital information fast. Here are some of the top changes. We’ve got a new branding and logo. Let us know what you think in the comments. In addition, most important to you, you’ll see right away that the website itself is more fun, better looking, faster-loading, and optimized for mobile phones and tablets. 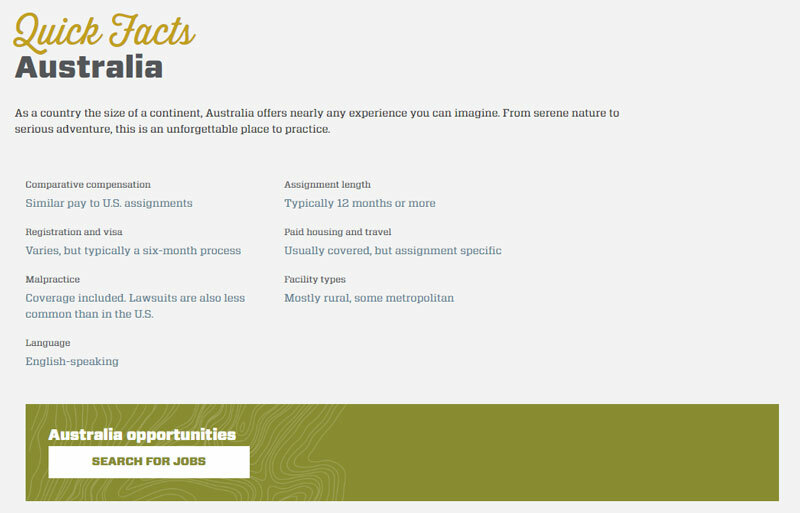 Our job search features new and better filtering by both specialty and location. In addition, each job features lots of detailed information, such as shift hours, hours per week, patients per day, location, duration, and more. Ever started browsing your dream jobs but then had to move onto something else? That’s where the ability to save jobs for later comes into play. Easily save those that interest you as you browse, then come back and apply when you can. We’ve added a feature to make it easy for you to quickly apply for a job that interests you. Just enter basic personal information and upload your CV to get the process started for an amazing locums assignment in New Zealand or Santa Barbara or China — or somewhere in between. This new feature saves you time and answers questions before you even have a chance to ask. For example, here’s a quick look at Australia. Of course, this website is a work in progress, so we'll be rolling out new features and improvements as we work to continually improve your user experience. One upcoming feature we’ll be launching soon is a new resources section, which will feature tools and information that can enhance your locums experience. It will feature international locums how-tos, FAQs, and more. Visit our new homepage to get started — and let us know what you think in the comments below.